S.P.In. srl is a young and dynamic company that designs and produces automation systems, and specifically systems for multimedia products purchase and rental. The facilities are located in Campodarsego and Vicenza, in the heart of the Italian North East, at the centre of a network of advanced industrial activities. Mediabank automatic DVD dispensers are well known all over the world. Years of experience obtained by its highly specialized personnel in the video rental field guarantee high levels of reliability and exclusive performance. 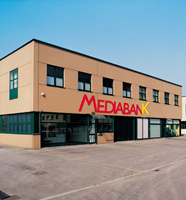 The high quality of Mediabank systems is ensured by the ISO certification. The investments in research and development, the application of the latest technological solutions, the personalized attention for the needs of each and every country and the constant collaboration with its clients are your warranty of quality.